Well, we did it. 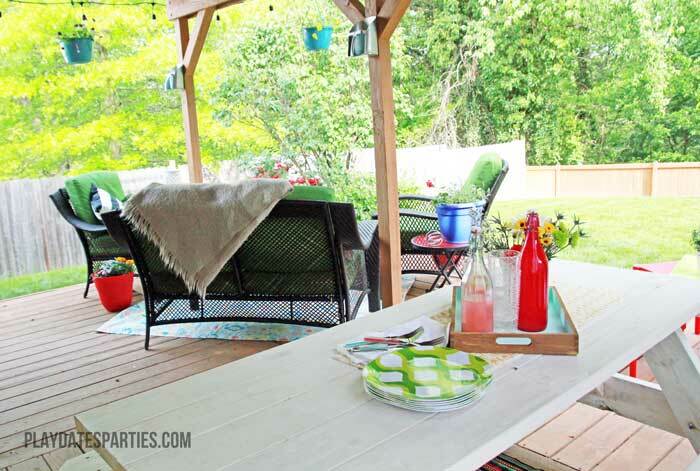 We transformed our backyard from a cluttered mess to a backyard ready for summer entertaining. Not just ready for entertaining…perfect for it really. It’s been six busy weeks battling poor weather, illness, and hectic schedules. If you go back to the original checklist, you’ll mostly see a plan to clean things up, get things organized, and get lots of gardening done. I never expected the space to become what it has. What was originally just two spaces turned into three. First, we have the upper deck, which was originally strewn with half-finished projects, and pots that were either broken or filled with dirt and dead plants from last year. 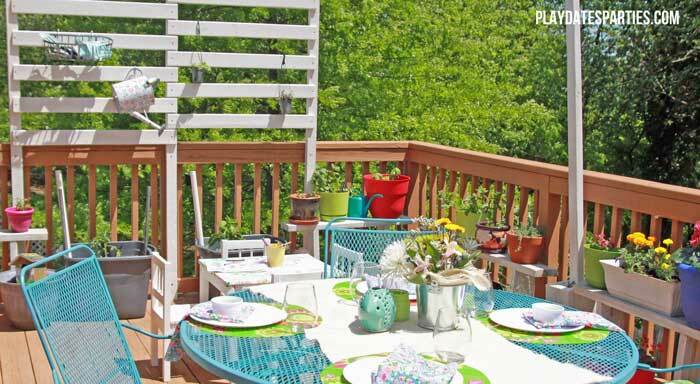 This deck is right off our kitchen, which makes it a perfect place for impromptu dinners or breakfasts that we cook inside. 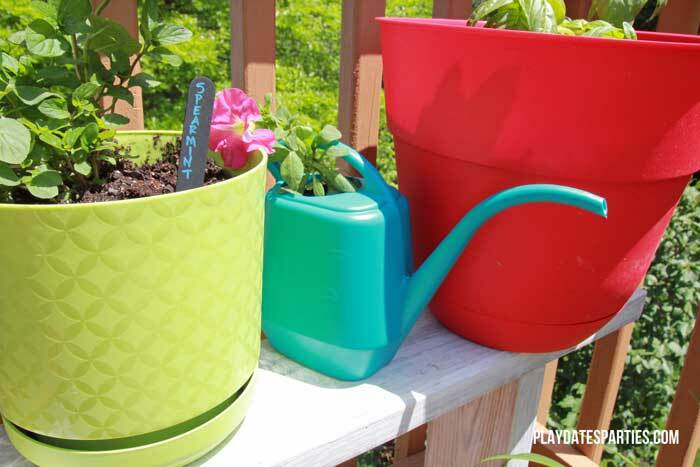 It’s also where we keep our potted herb garden, and now our vegetable garden as well, in our self-watering planters. On a whim, I decided to take count of the potted garden and counted over 25 pots just on the upper level. 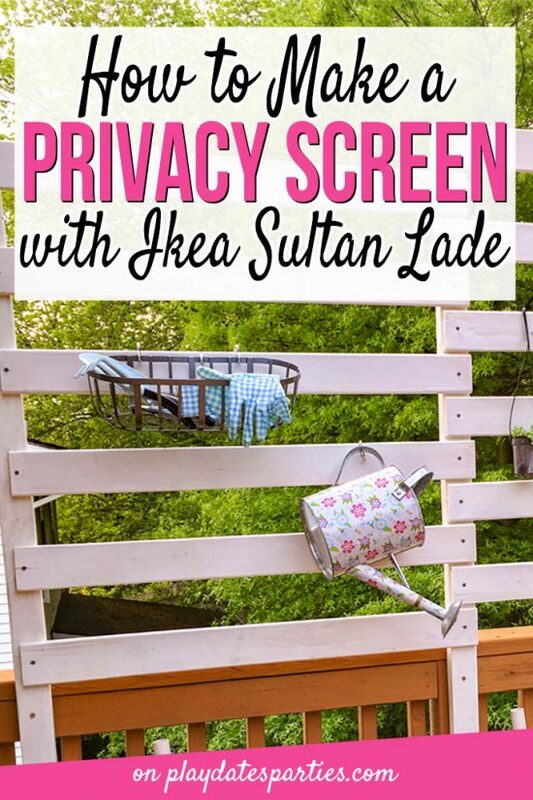 Our new privacy screen at least partially blocks the view of our neighbor’s yard and turned out to be a great place to put up some light hanging baskets and some S hooks for storage. 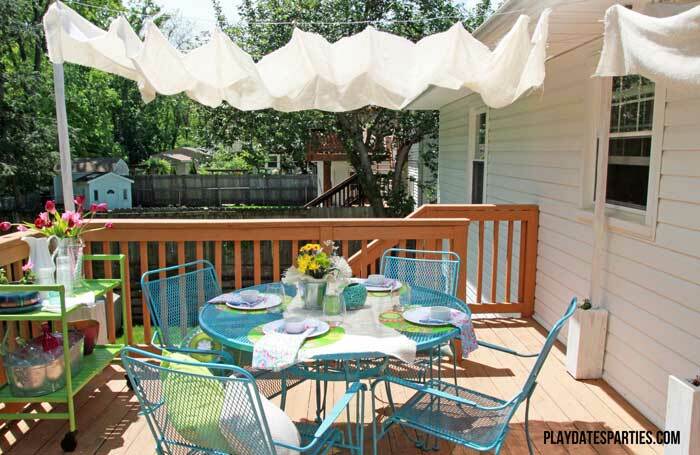 And a new retracting canopy provides shade from the intense sunlight that hits the deck nearly all day long. This canopy was a labor of love; started while I was pregnant last summer using scraps of lumber. Only this year did I finally string the wire between the posts. White burlap hung from curtain hooks provides just the right amount of shade. This space is my oasis. 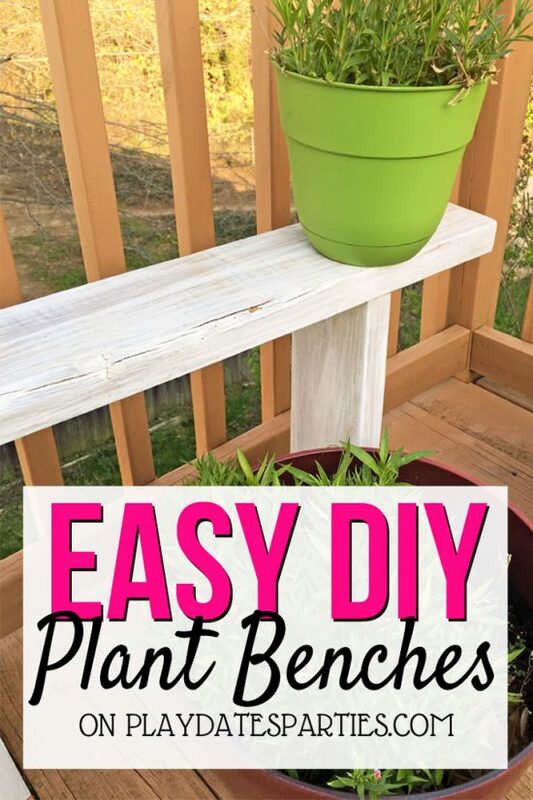 I can’t wait for the plants to fill in over the next couple weeks so the girls and I can harvest the herbs for dinner and pick fresh flowers for our dining room. The upper level is mostly for our little family. 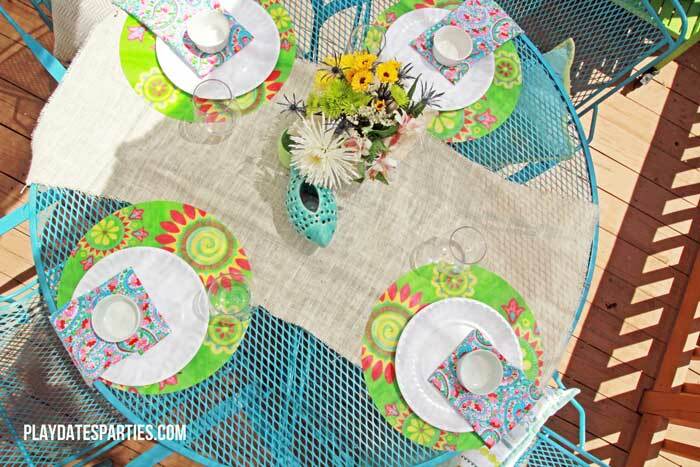 For weeknight dinners at sunset and for drinks under the stars with the Husband. But the lower level is where all the entertaining and party magic happens. At ground level, we keep the Husband’s charcoal grill, and the lower deck now houses our picnic table and freshly updated patio furniture. The new shade of bright green on the cushions makes me happy every time I see it. For years we avoided putting both both the seating area and picnic table together, but it actually works beautifully. And as luck would have it, I found the perfect addition to use as a floor cloth underneath the set. I’ve never been one to shy away from bright colors and pattern, and this is no exception. 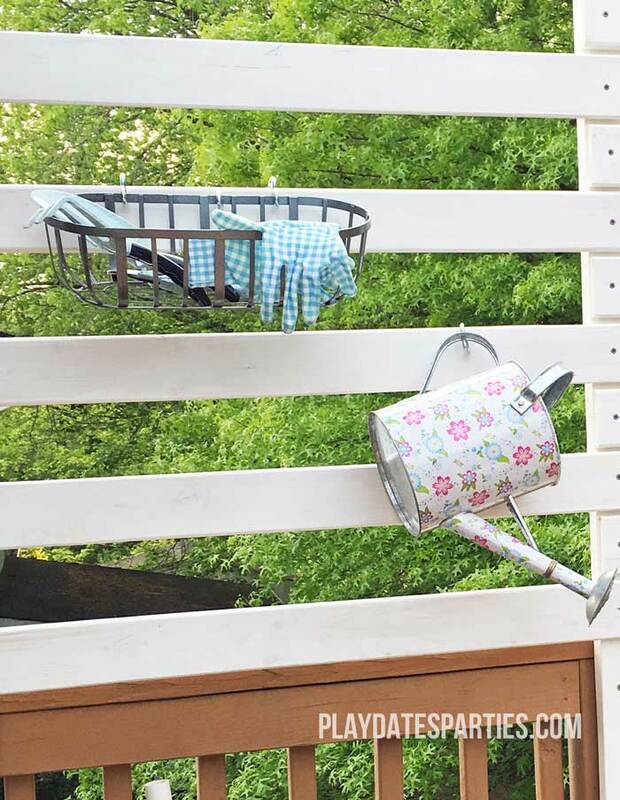 Where the deck box used to sit and hold the kids’ toys now stands a galvanized steel shelving unit from Ikea. It’s just big enough to hold a few accessories to liven up the space. 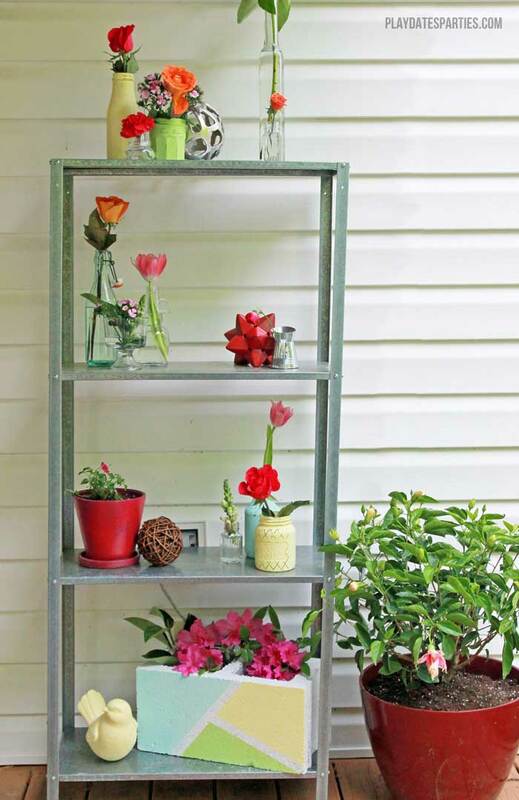 The chalk-painted cinder block vase is both fun and functional, as it helps to prevent the lightweight shelving from knocking over in any wind gusts. 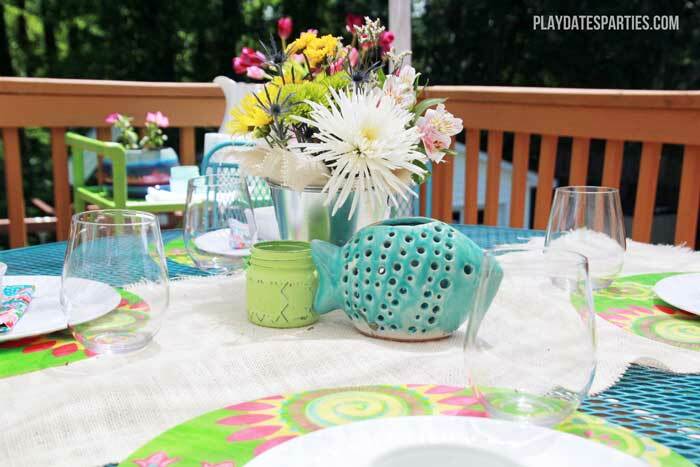 I look forward to styling it with bar items, favors, and other party essentials this summer. At the picnic table, we can seat our whole family plus the in-laws. Or the kids can eat at their own little play table just next to it. I expect we will have several barbecue dinners eaten out here this summer (as long as this rain doesn’t keep up!). 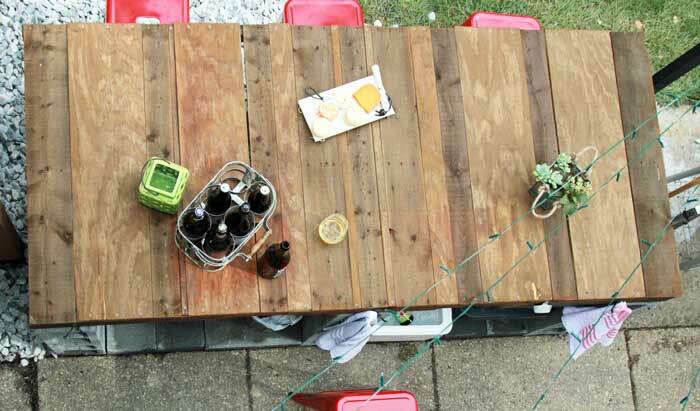 The pallet-and-scrap-wood-turned-bar is our absolute favorite area and wasn’t even part of the original plan. It all happened because the Husband wanted a prep table…and we ended up getting a large pallet when the storage shed was delivered. So his little prep table became a giant prep table and bar. 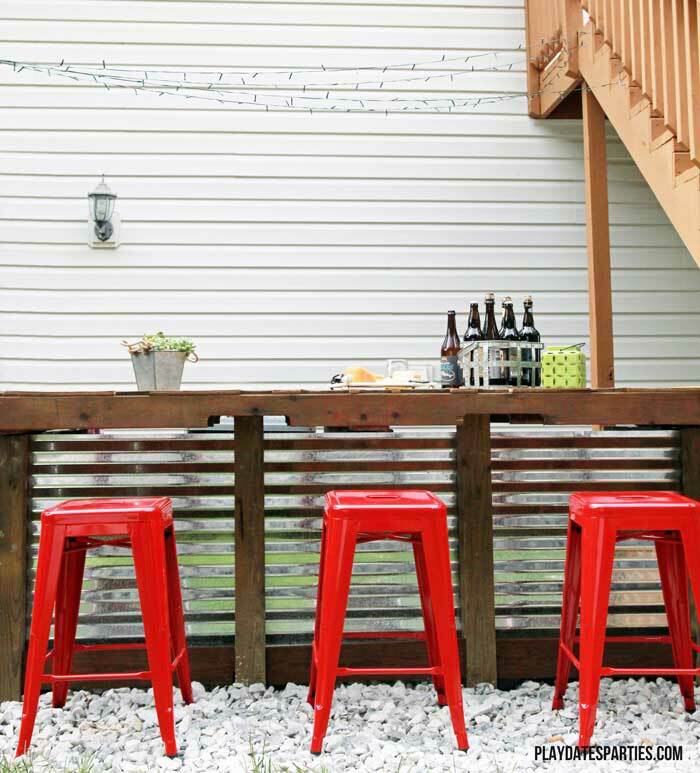 The corrugated steel front, solar-powered twinkle lights strung above, and bright red stools really finish it off perfectly. Even the kids have already enjoyed some snacks at this spot, and I can easily see it becoming the most-used area in the entire back yard. When the sun goes down, the fun doesn’t have to stop. 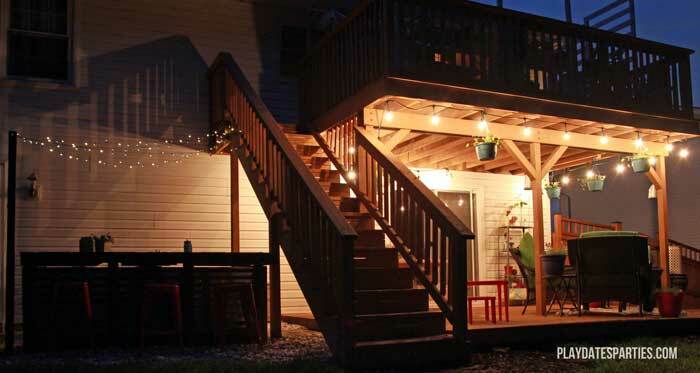 I strung the outdoor patio lights around the lower level deck last summer, and they provide plenty of light for the whole space. The twinkle lights above the bar add just enough ambiance and additional lighting for those late-night drinks. Every spring I get excited about getting our backyard ready for summer entertaining, but this is the first time I feel as though the space is really pulled together. I have to thank Linda from Calling it Home for hosting this challenge. There is so much incredible inspiration going around for the One Room Challenge, and it’s been a fun, albeit tiring, process. I can’t wait to give it another go in the fall! wow, it turned out so nice! The 3 sections work very nicely together, so colorful and inviting. I need to check out how you made your prep/bar corner. 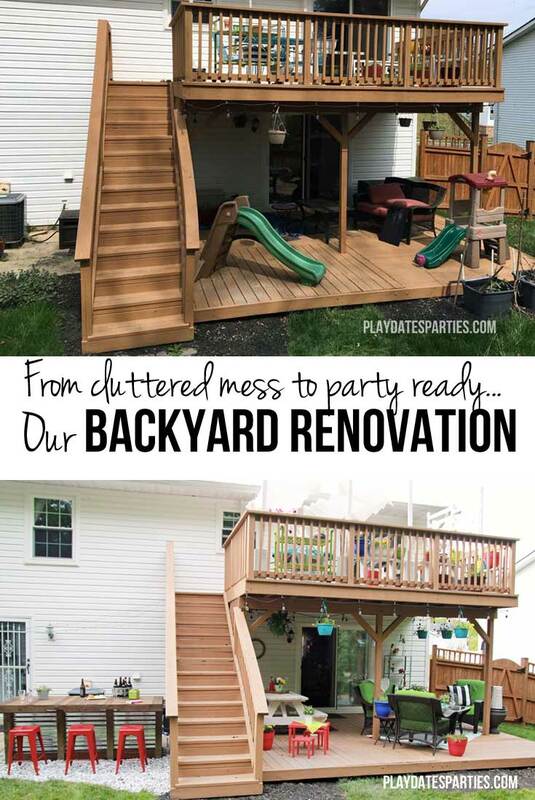 Hope you and your family enjoy your new backyard, if it ever stops raining! Thanks so much Morgane! 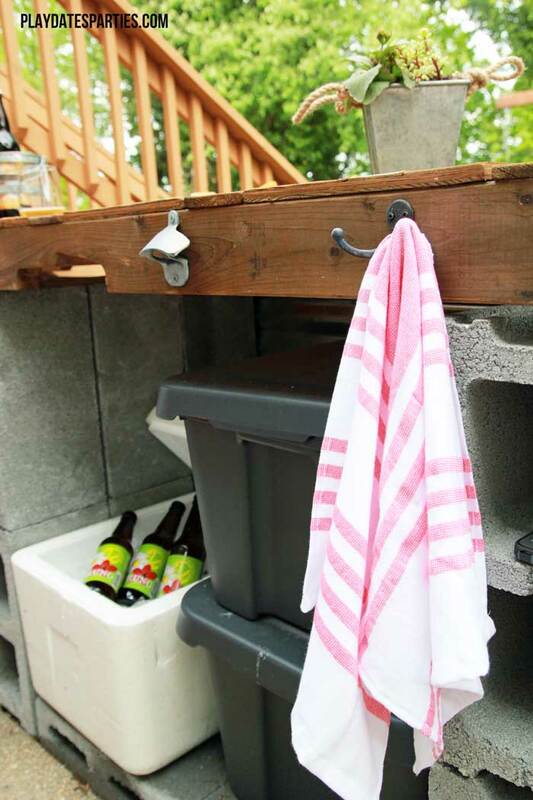 The bar was actually pretty simple to put together…it just required a lot of heavy lifting. Yes, lets hope this rain ends soon! How festive and inviting! I wish I had a space like this! Congrats and enjoy it! Thanks Iris! 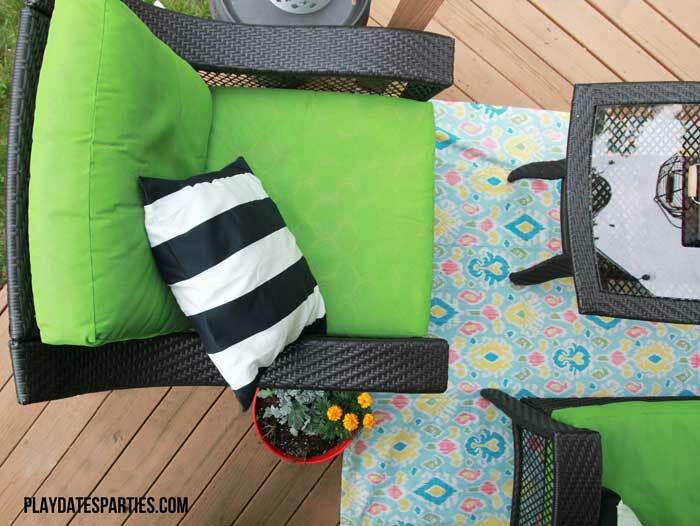 I look forward to enjoying the space all summer long! 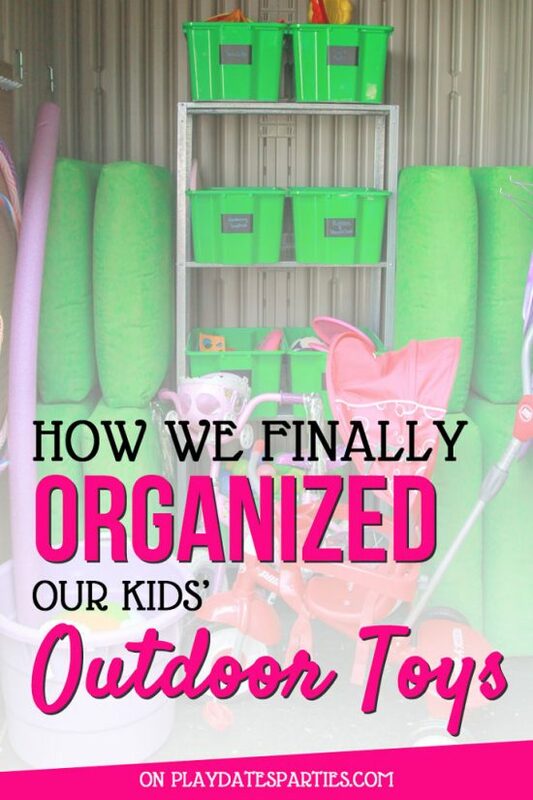 All our children and my husband have summer birthdays, so we will have plenty of opportunities to use the space. Thanks so much for stopping by! I think the shelving unit is my favorite! As well as the twinkle lights. No doubt, this is one of the best I’ve seen. The shelving will definitely come in handy. So much prettier and more useful than that old deck box! Wow, so much color and happiness. This place looks SO much better. Congrats! 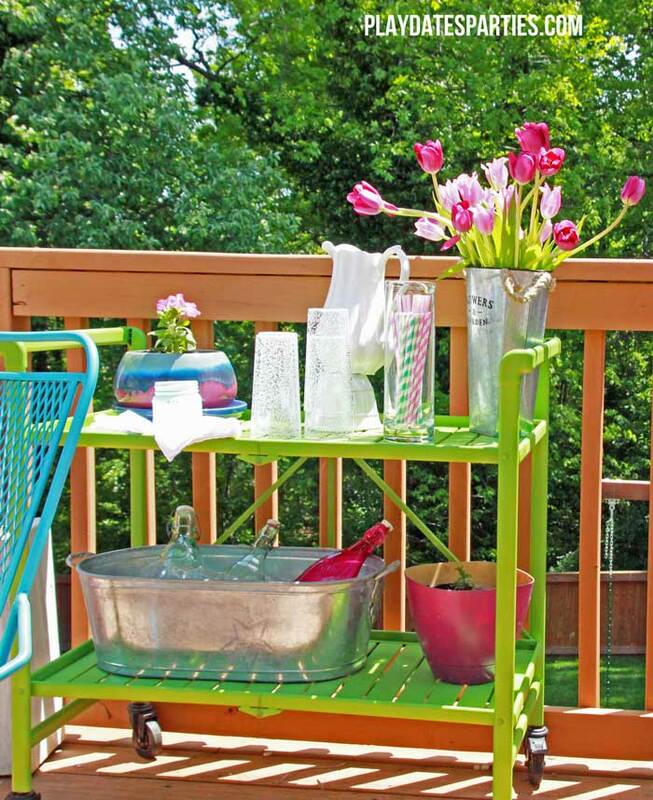 I’m definitely a fan of colorful outdoor spaces. Thanks for your kind words and for stopping by! I think the bar is by far my favorite part! It’s my favorite too! Thanks so much for stopping by! 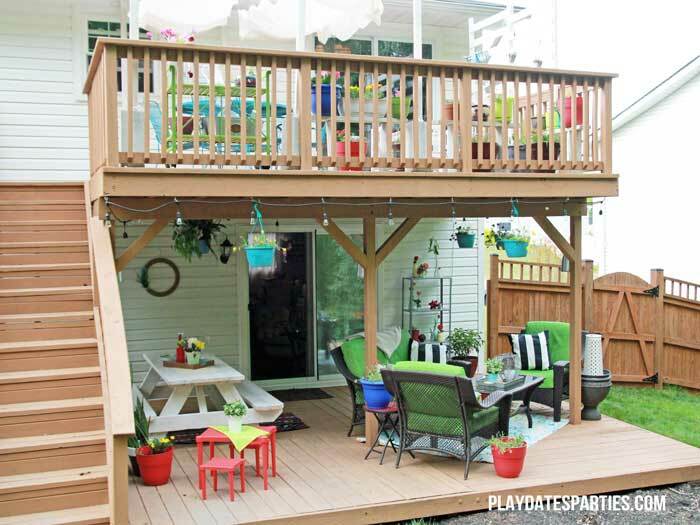 What an exciting new space for your family…just in time for summer! 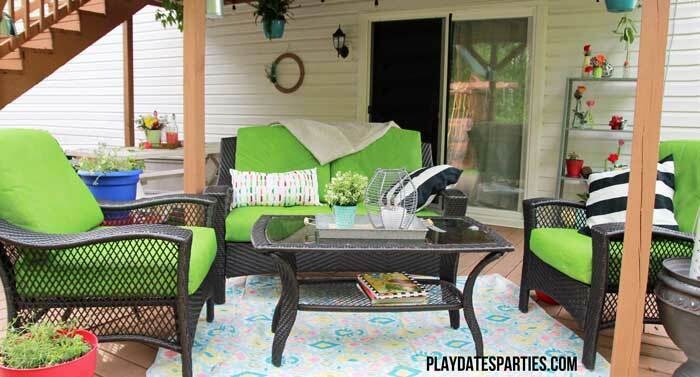 I love the colors you selected to create the backyard retreat. Still can’t get over how amazing the painted cushions look. I definitely have to try that. Thanks so much! Obviously I love bright colors…especially outside. Let me know if you do give it a try! You are AMAZING Leslie! This is so beautiful in so many ways. I love the multiple seating arrangements (even the kiddie table!). The table on the top and the bottom. And the lights are gorgeous. 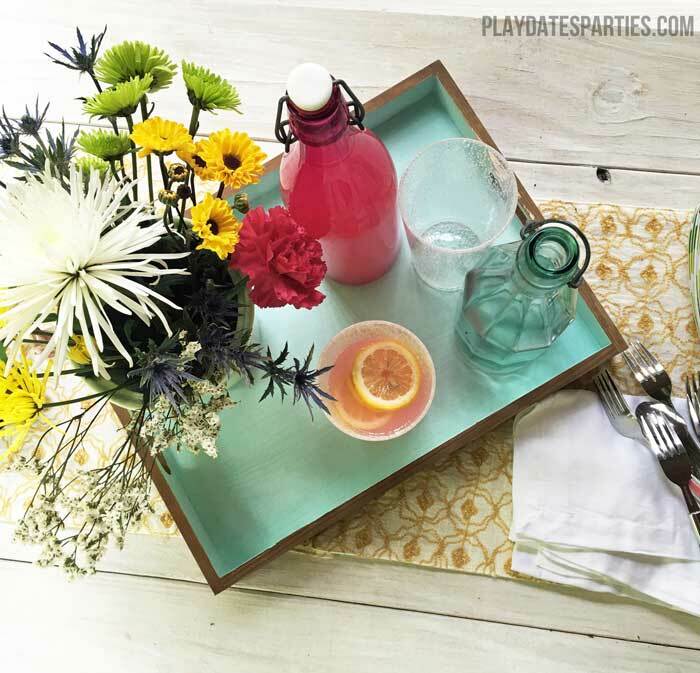 Here’s to so many parties and entertaining for you and your fam! Well done! Aww, Nina, you’re sweet! 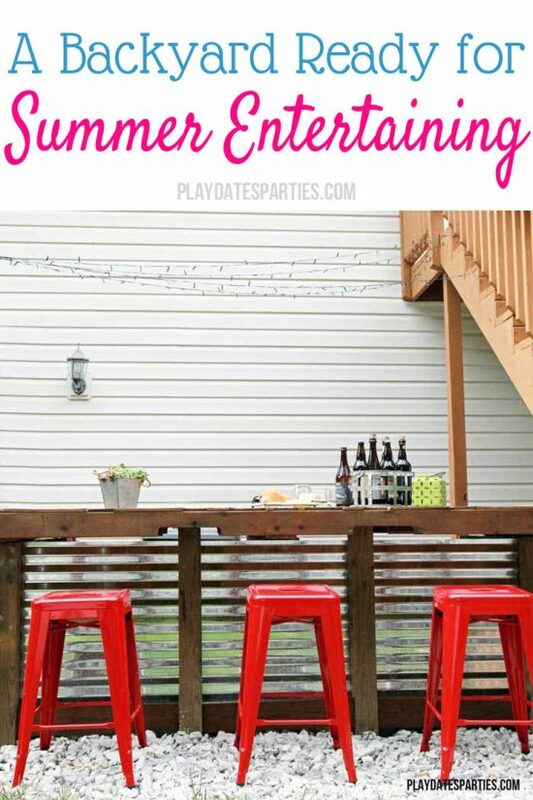 You know you’ll be seeing lots of party pictures in this space this summer! It all looks great but I seriously love that bar area!! You are right that is also perfect for kids’ snacks! I am so jealous of your space!! Enjoy it this summer! The only drawback to having the kids sit at the bar is that they can’t stop kicking the corrugated steel. They just love the big banging noise it makes! Thanks Elise! I’m looking forward to a clear evening when we can actually toast the completed space. Wow! Such a huge transformation. So many wonderful, usable areas, but I love that prep table/ bar too! I love it! What a great place to entertain! 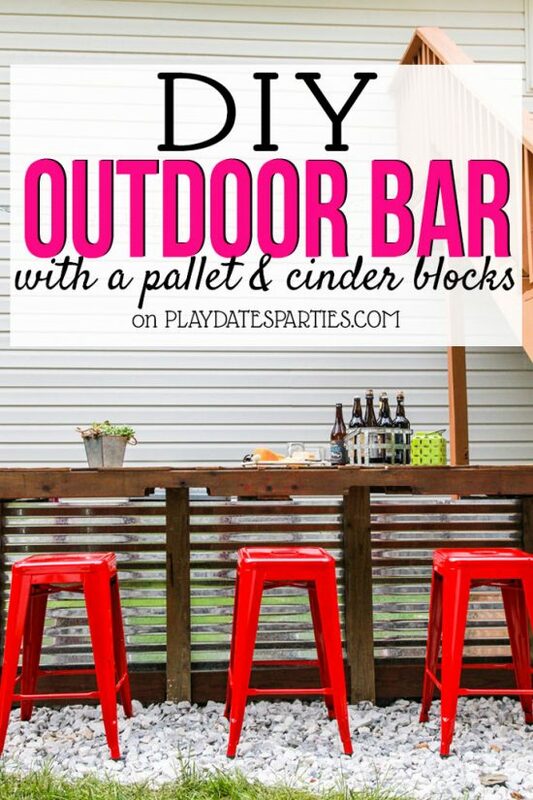 I’m going to have to ask my hubby if he can build me one of those outdoor bars! It was really easy to build. I actually put it together in a day. I will update the tutorial post when we’ve actually got everything secured, though. I plan on spending as much time as possible out there this summer, that’s for sure! Wow! When is the party?! You have thought of everything my dear and I think you and your friends and family are gonna have a fabulous summer because of this awesome space!Congrats and CHEERS to us for another room done! Definitely cheers to another room done! Though I’m already thinking about the next ORC……..
Oh Leslie, where do I start?! Ok, that bar? Awesome. 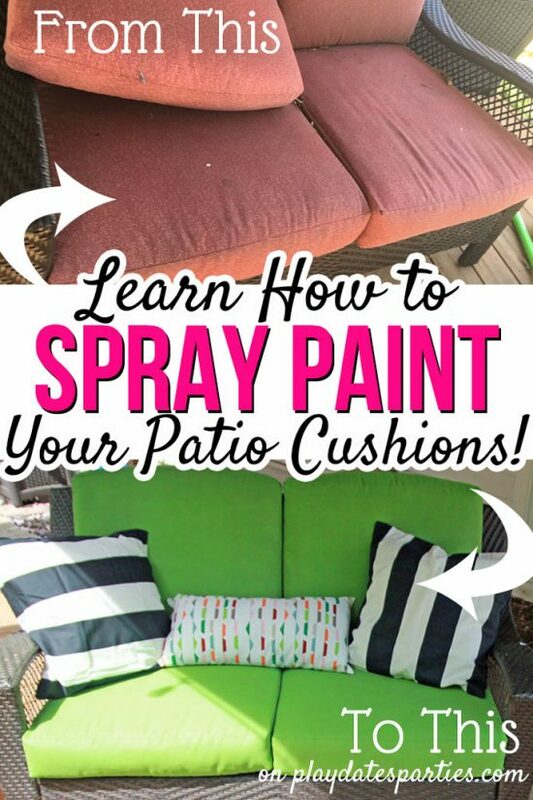 Your cushions – and that you spray painted them? Awesome. I love the red accents.. My fave color! This whole space is my dream! It’s bright and inviting and begging for a bar-b-que. I’ll be right over with wine, with my hubby and kids in tow! Great job! I was really going more for a teal and green color scheme, but the Husband wanted the red stools so I made it work with a few extra red accents downstairs. The red kids’ table was actually just an awesome stroke of luck! Don’t you love when that happens? That new bar area is so brilliant – I love it! I love, love, love this space! 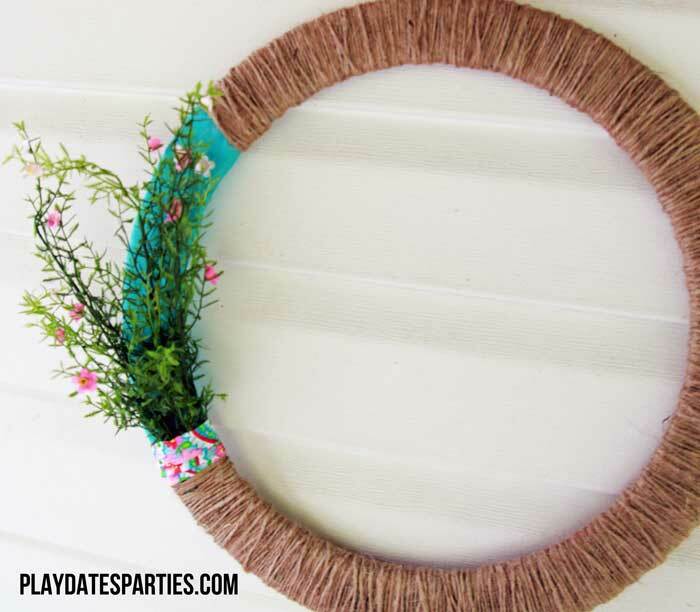 Did I miss tutorial for the burlap retractable cover. I want to make one. What a great space! 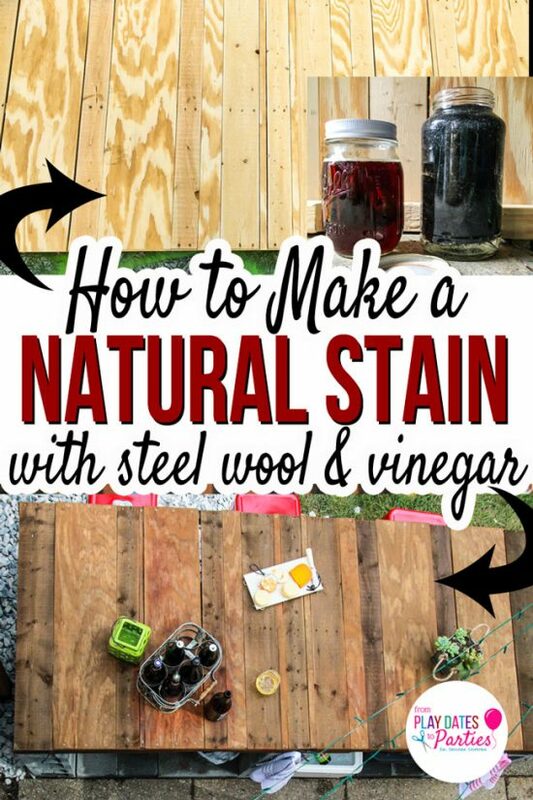 I am currently working on fixing my patio and you have given me some new inspiration! I haven’t yet posted the tutorial for the retractable canopy. It went up the day before I photographed everything, so I want to be sure it’s sturdy before posting about it. It’s definitely on my calendar to post about, though! So colourful! The perfect summer backyard!!! Amazing job in 6 weeks! Well done! Thanks for noticing the hooks! It was a huge pain getting the s hooks open, but I love the extra plants I can keep up there. Such a fun space. I love all the colors! That prep area is gorgeous! It’s always those last minute ideas that are the best. Beautiful job! 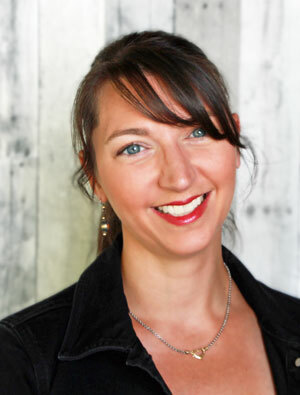 I love everything about your renovation and would love to come over and hang out to enjoy it! Everything looks GREAT! I wasn’t able to comment on your Father’s Day craft posts, but loved the ideas and really like the cut-out picture frame! This is so fun! my favorite part is the bar. Awesome. I obviously missed this post when it was first published but glad to have seen it. Lots of pins here. Cannot wait for summer! Cheers, Leslie! We have been renovating the outside of a 1970s house. I feel it’s time to do the inside. I do like wallpaper but it is everywhere in this house and I want to update and finally put a bit of me into this house. 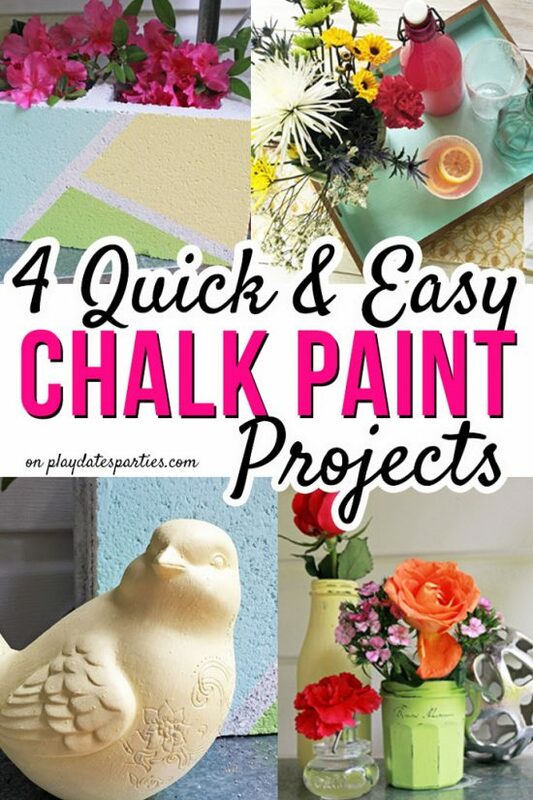 I have a few idea’s and of course I have always said if you don’t like the color we can paint over it. But I want to do it the right way, that is what brought me to your site. 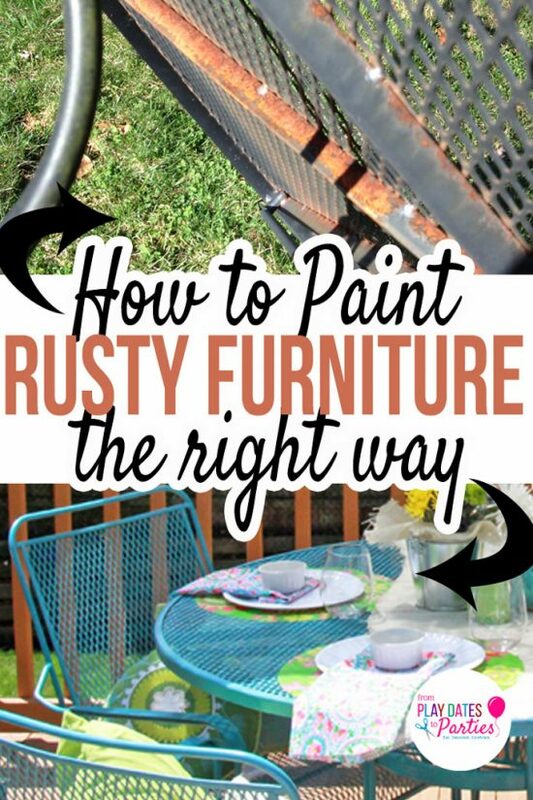 Your painted cushions and metal furniture are inspiring. So please help me to beautify my old but restained deck, pagoda and veranda (a concrete porch that I wanted covered for my wicker furniture).